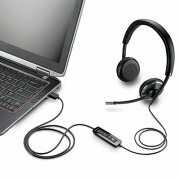 Plantronics C520 Blackwire is a dual-ear USB stereo headset. When a call comes in, just put it on; its Smart Sensor technology automatically answers and provides audio alerts to manage connection, mute, and volume status. With wideband audio, noise-canceling microphone, and hi-fi stereo you always get clear, natural, and rich audio. And the unique Dynamic EQ feature adjusts and optimizes audio settings on the fly, creating the best sound for voice, music, or multimedia. 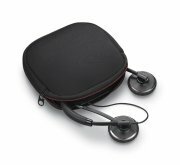 The Blackwire C520 Series is a business-quality communications solution bringing unmatched audio quality, all-day comfort, and easy portability — all in a compact, durable package for smarter workers everywhere.